You hit on a subject matter that is near and dear to me. 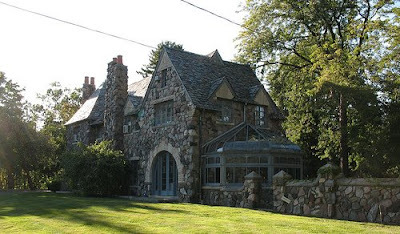 Ever since my wedding day, when a friend of the family opened their gorgeous Flint "estate" home - I have been obsessed with the beautiful houses in Flint. Recently, I was in love with a foreclosure there. An estate home that just needed some TLC. It was stunning, and shockingly in our price range. Unfortunately, it would have made a depressing commute for my husband (ha, but I tried!). Thanks for highlighting on these fabulous homes! yay! it's about time we saw something to write home about! :D Keep it coming. as an old west-sider when we were kids the woodcroft area was affectionately referred to as the "rich district"
what a great place to ride ones bike and take in all of the scenery. i had a few friends that lived in that area and they were just as goofy as we commoners. one girl's house actually had an elevator to travel between the three floors. a friend of mine had a heated driveway no shoveling when you had cheap electricity. another well kept secret is the circle drive area bordering the Flint Golf Club. 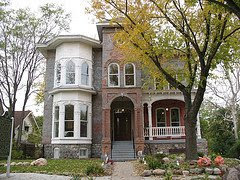 there are many beautiful homes that are still in very nice shape. i've heard that the developer of the area was from california and i must admit many of the houses have that california feel. when we got to high school we soon learned that this area is the "rich district" of the south-side...many of the students at southwestern from this area had parents who were professional people. the weird thing about circle drive is that most people who have lived in flint for years and years don't even realize that it exists. why i thought everyone knew where the scenic thread lake was located. The curvilinear layout of Circle Drive and environs dates to the "Roaring Twenties" and the recording of the plat map -- going from memory here -- "Flint Golf and Country Club Estates." The homes thereon were developed over the years as opposed to all at one time thus there is not necessarily a developer associated with the entire development save for the original financing from local banks and entrepenuers. Like many of Flint's subdivisions, it was developed piecemeal as necessity dictated but developed, nonetheless, within the confines of the original recorded plat. The surveyor of the original plat was George Meade (1867-1944) who over the years was partnered with various other engineer/surveyors, to wit: Meade & (Charles) Branch, Meade & (Robert) McFarlan, and Meade & (Foster) Roser. i realize that the area was laid out well before the homes i am speaking of were merely saplings. but if you take a close look at some of the homes from the late 50's thru probably the 60's they have that west coast feel. Hey.... that house at the top is incredibly similar to the one where we lived, 1970?-1980. But ours was gray, and the lower windows weren't double. Plus, nowadays, there's an ugly chain-link fence in front. All my friends used to tell me it looked like a funeral parlor or a haunted house, in truth. But it looked just like that one! chief rutherford, skaffs, hamadys, dr. moore, dr. hennesy, some local 'big names' on that side of miller rd. Slick. we'd cut through there on the way home from southwestern. Is one of these Henry Hanflick's old digs? First place I ever set foot in that had separate wings. Excellent place for hide and go seek. Heard some other funny stories about his place buut thats for someone else to tell. Tell us the stories Würstside Warlord! The bottom two homes look more like Woodlawn Park Drive than Woodcroft Estates. Anyway, now that I'm taking a real good look I'm not so sure. Hanflik is a lawyer. Ya gotta be careful what you say. The dude'll sue you fer sure. Hey, my passwørd ain't working AGAIN. Can you get "banned" from blogger? Wurst, I think blogger is just acting weird. I've had trouble logging on for two days. He's forgotten to include Woodcroft! My neighborhood! This so-called "Circle Drive" is Parkside Drive. 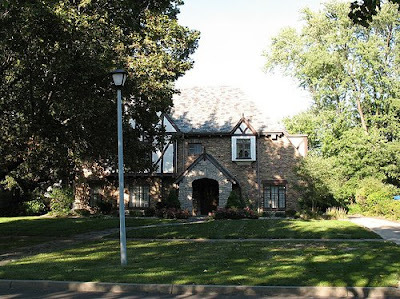 Many of the homes located on it and Westwood Parkway are delicious and rival those found in huge cosmopolitan areas. I love Flint! Actually, it really is Circle Drive in South Flint. 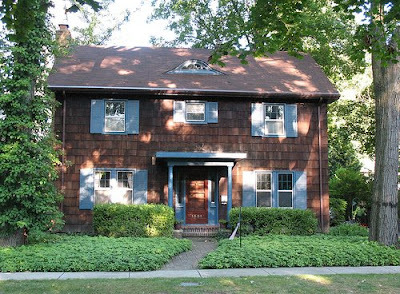 For the first ten years of my life (1950-1960) we lived on Dearborn Street and I had many friends who lived on Circle Drive. Also, my siblings and I often rode our bikes from our house on Dearborn to our grandparent's house on Oakley Street. Our bike route was Dearborn to Algonquin to Circle Drive/Lakewood Drive to Orville to East Oakley. Fond memories! Henry Hanflick is actually spelled Hanflik. The homes that are affectionately referred to as California homes are actually English Tudor homes and English Revival. Woodcroft Estates in Flint has both styles. Young Doctors, Lawyers, and business professionals are raising there young families there now.